November ...time to change up our calendar for Read the Nobels. If this is the first time you're hearing about this, these calendar wallpapers are a fun monthly project I cooked up for myself and is a sneaky way of promoting the Read the Nobels Reading Challenge for 2016. I select an author who has won the Nobel Prize in Literature, a book cover, and a quote. Two more months to continue reading for this challenge for the year! So, how are you doing with the challenge? I still haven't done much personally with the challenge but with the research comes a much longer and much more informed TBR -- after all I am in this for the long haul as the Read the Nobels Challenge is a perpetual challenge. This November, I am featuring a poet, one of the few in the Nobel Prize for Literature laureates. The winner for 1971 is Pablo Neruda, a Chilean poet-diplomat-politician. The cover below is from his book Love: Poems from the Film Il Postino. * Not surprisingly, the movie is about Neruda. Have you watched it? Do you like poetry? 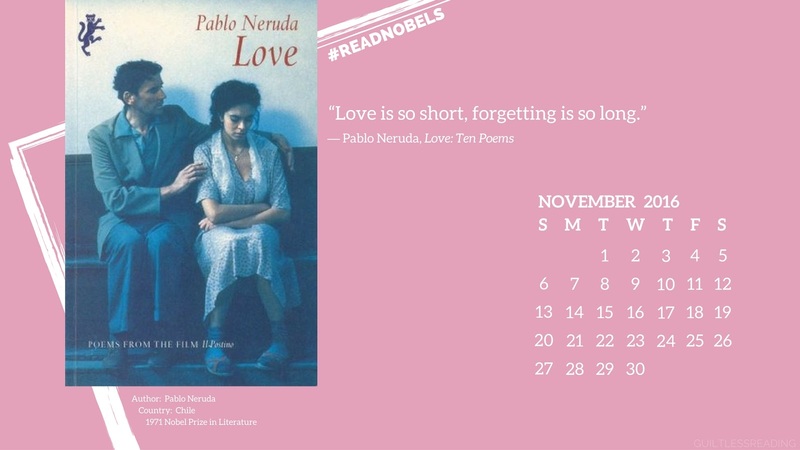 Have you read any of Neruda's work? 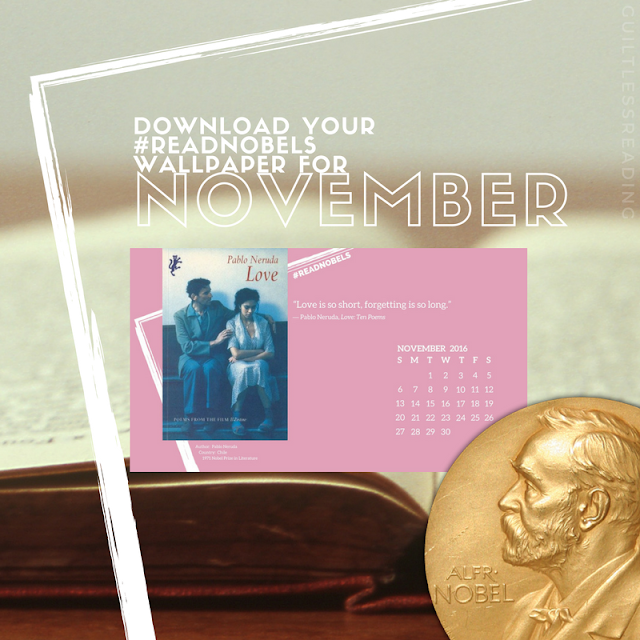 Download the November Read the Nobels wallpaper! Get some Nobel Prize winning literature in your reading lists! All it takes is one book for the entire year. Click to join the challenge RIGHT HERE! SIGN UP HERE for the yearlong event!